A number of business stories today concern investigations of GoPro and their current problem(s) with the Karma drone. Specifically, the issues concern whether GoPro knew at the time of the recent conference call and quarterly earnings – that date and time being 11/3/2016. On that date, poor earning were announced and the stock plunged over 20%. Soon after, the stock made up those losses…only to fall again when news of the Karma Drone Recall hit the streets. Following is a discussion of the timeline as well as our opinion on this matter. A basic history of the Karma Drone is at this article on our site. The relevant portion may be the delay which was announced only weeks before a planned release in June, 2016. We have no information as to the matter(s) which caused this delay – only that the delay was last minute after a full launch and marketing campaign was organized. Note that in our article, we listed out 3 scenarios of which a recall-type event was one. The first well-known crash of the Karma Drone in the R/C (Radio Controlled) community was published on Youtube on Oct 28 – we can assume the flight happened that day or the day before. At the time of publishing, the Karma owner had written that they contacted GoPro support. After that crash, others started being reported. In addition to crashes, there were also “flyaways” – which resulted in a loss of the machine. Reports suggested that the GPS or R/C control (connection) may have been at fault, although user error is always somewhat of a possibility. Here is one example on 11/2/2016 – the user also claims to have called GoPro. In the following days more and more crashes were reported. Note – this was not a situation where they ALL crashed or even a large percentage. Many owners flew with no problems. On Nov. 7, I tweeted to GoPro and lead Karma developer regarding the crashes – and asked that they do something about it (or look into it further). The next event in this timeline was word of the recall – which we (Droneflyers.com) broke first on Nov. 8 at approx. 3PM EST. The first reactions from the R/C community were accusations that we were spreading false rumor – as both Facebook Groups (which may contain some GoPro employees or contractors) as well as direct chat to GoPro customer service denied the recall. To confirm our story, multiple parties (including myself) visited both BestBuy and the BestBuy web site. At a BestBuy in Sarasota, Florida there was no stock (just a display) and the salesperson was unable to find the machines on his computer. At a BestBuy in Tulsa, OK the manager had stock but claimed they were recalled and yanked the products from the shelf. Soon after – approx. 6-7PM EST, word was received from GoPro regarding the recall. Our Initial Take – What they knew and when they knew it. Note – we are not investors in GoPro – our interest is in the entire Consumer Drone industry as well as public safety and education. We offer up the following opinions and editorial only as our own view(s) on the matter. I think it’s important to start with this fact. Various consumer drones, including some well-known brands, have had defects which make them fall from the sky (power loss or other complete control loss). The difference, in this case, is that these companies are not public – that is, they are not on the stock market and therefore are not subject to securities and other codes and laws. 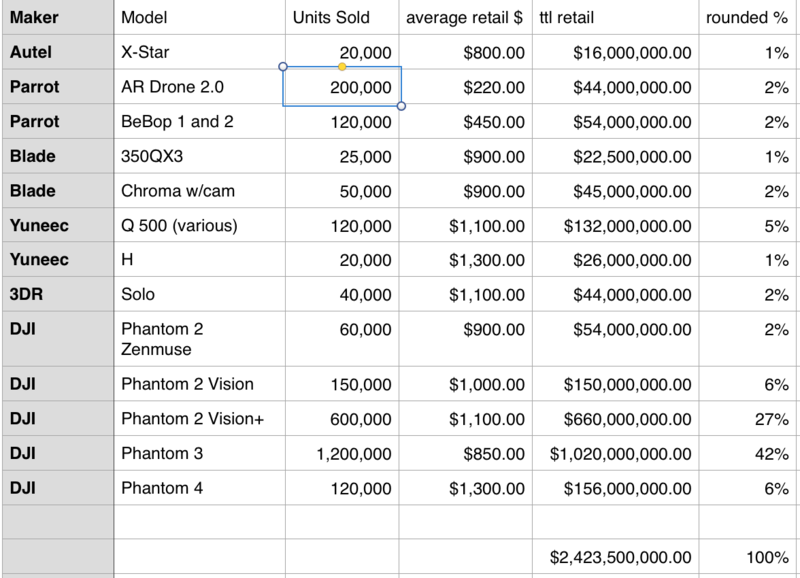 Having studied the industry intensely for years I’ve developed a sense of scale about drone crash incidents – that is, how many happen vs. how many are sold and flown, and whether this represents a clear defect or problem. As part of my work I spend time closely studying the introduction of any new consumer drone – and so have followed the Karma almost hourly from launch and would have probably known if the situation was critical. When only a couple incidents are reported it’s difficult to come to any conclusions about the causes and the solutions. It may be related to pilot error (lack of calibrations, etc.) or something as simple as not pushing the battery all the way in. Both have caused many a drone to fall from the sky. The obvious question here is “What did GoPro know and when did they know it”. We have no insight into the earlier facts of the matter (why the initial delay, production delays, etc.) – only discovery within GoPro will answer those question. On the matter of when it was clear that a recall or other serious event was clear to GoPro management – my opinion, based on public (forum, youtube, reports, etc.) information would be that it was likely that GoPro management didn’t yet have enough information to make the call much earlier. In fact, their recall and reaction was quite quick, especially in an industry known for lack of such (I don’t think there has ever been a recall in the consumer drone space despite MANY defective products). GoPro is actually being praised by some in the R/C industry as well as some owners for their speedy reaction in this matter. The situation is likely complex as GoPro is under the gun from investors based on their lack of profitability and their “blue sky” forecasts – which now have almost zero chance of coming to fruition. The good news here is that a potentially dangerous product is off-the-shelves. One beef I do have with GoPro is that, in their marketing, they seemed to intentionally deceive regarding the weight and mass of the Karma Drone. It was being sold both as portable and “ultra-compact”…descriptions which would lead (and did lead) potential buyers to consider it lightweight. In addition, GoPro does not list the total weight of the product in their specifications – rather they have put forward a figure of 1006 grams (2.2 lbs) – See the screen shot below. This weight has been repeated over and over again by (clueless) tech publications and the mainstream press – even USA Today. Unfortunately, the truth of the matter is that Karma is the heaviest consumer drone made – or very close to it – at 4.3 lbs. 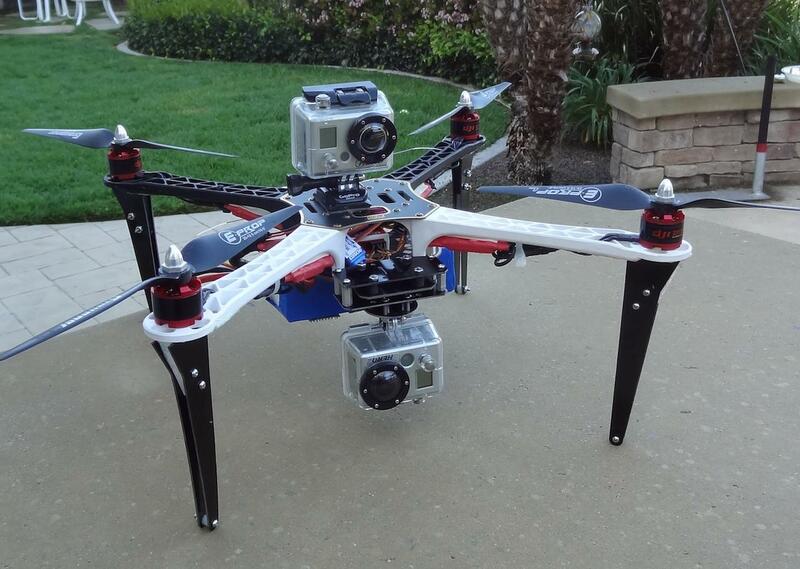 GoPro is printing the weight without a battery, gimbal, props, camera…or even propellers! Physics may show that a falling object of this weight can cause serious injury or even death…much easier than one of 1/2 the weight. Rough calculations show that 2-3 lbs can (depending on angle of hit, where it hits, etc.) injure badly while 4+ lbs can do even worse. I implore GoPro to change these specs to reflect the honest flying weight. As opined above, it’s not clear or even likely that GoPro knew much about potential hardware defects in the models being sold previous to the beginning of November. Prudent engineering requires careful study of user complaints and incidents to discover the root cause and understand the proper further actions required. Hopefully GoPro can locate the cause, fix it and re-release the Karma in a reasonable time frame. 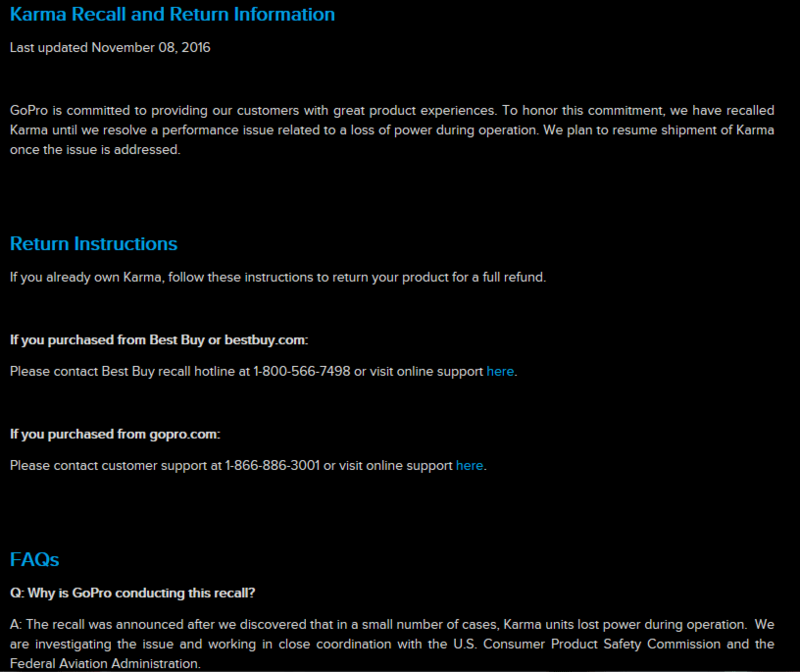 The current recall is “return only” and is not stated as “repair”. This is an important distinction since it gives no indication as to when, or even if, Karma will return to the shelves.